A few weeks ago I started beading a piece for a challenge for Bead Mavens... the challenge was to 'meld' two or more tutorials written by the Mavens. 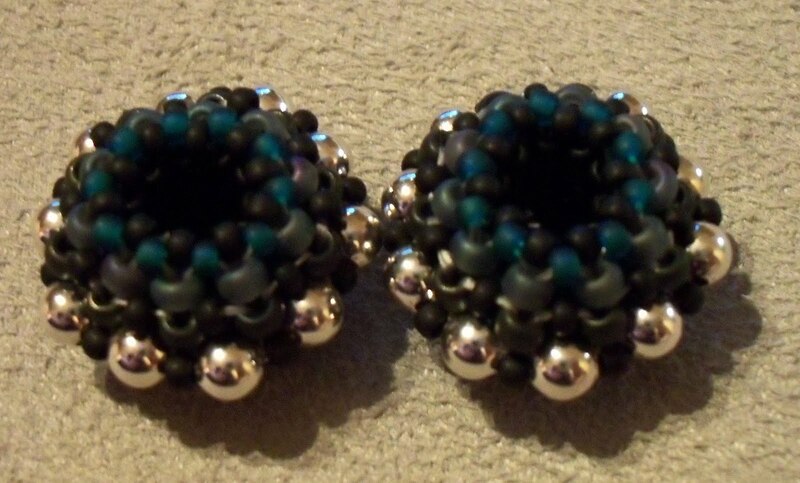 I started off with Heather Collin's satellite beads, making them from black, teal and grey beads with sterling silver accents. I beaded up three of these beautiful beads, the third (not shown) has silver bi-cones instead of rounds. My plan was to then incorporate these beaded beads into Nancy Dale's Trellis Necklace. This was where I got stuck - it was nothing to do with the tutorial (which is very well written and beautifully illustrated), and was entirely to do with getting my head around how I was going to get these two components to fit together! The beaded bead on the left is going to be the focal point of the necklace, with its silver bi-cones and extra flashes of teal, it is bracketed by two slightly smoky looking faceted rondelles, the beaded bead on the right has smaller, haematite-coloured faceted rondelles on either side. Encouraged by my progress, I carried on beading sections of trellis rope, and added the final beaded bead, and more faceted rondelles. It doesn't show too well in these photos, but inside of the light grey AB trellis is a RAW rope made from matt black and teal 11/0 Tohos. The trellis is made from 15/0 Miyuki seeds. I carried on beading as the sun went down (hence the shadows in the photo above) and added some further trellis sections. I'm actually really enjoying the way this is turning out... it is definitely a challenge though. Part way through beading this evening, I came up with an idea to make this into a long necklace (instead of a standard 18" one), which was going to be tremendously assymetric, with the beaded beads on one side, and bezelled agate rectangles on the other... it may still turn out that way, but as I only have two weeks to finish this before I head off to LaVidalerie for my holiday, time is of the essence! Is anyone else out there Melding? I'd love to hear about your progress if you are!